Rome, Italy, August 13, 2014 (CNA/EWTN News)—The annual meeting of Benedict XVI’s students from his time at the University of Regensburg will gather next week to discuss the theology of the cross, a member of the circle has said. The Ratzinger schuelerkreis, or “students’ circle,” has met to discuss topics in theology and the life of the Church since 1978, when their professor was pulled from academia to become a bishop. This year’s encounter will be held at Castel Gandolfo August 21–24. “As usual, the members of the schuelerkreis presented Benedict with three possible issues to be discussed, and Benedict chose one from among them,” Father Stephan Horn told CNA August 11. Father Horn, a Salvatorian, was Ratzinger’s academic assistant at the University of Regensburg from 1971 to 1977 and is now organizer of the annual schuelerkreis meeting. Menke teaches dogmatic theology at the University of Bonn. The author of several papers in christology, the theology of the cross, and dogmatics, he gained prominence when in 2011 Ratzinger quoted from Menke’s book Jesus Gott der Sohn (Jesus, God the Son) in his book Jesus of Nazareth: From the Baptism in the Jordan to the Transfiguration. The idea for the annual meeting arose in 1977, when Ratzinger was appointed Archbishop of Munich and Freising, and when he moved to Rome in 1981 to take up the post of prefect of the Congregation for the Doctrine of the Faith, it continued. When in the spring of 2005 Cardinal Ratzinger was elected Bishop of Rome, his former students thought their annual tradition would stop but were proved wrong. 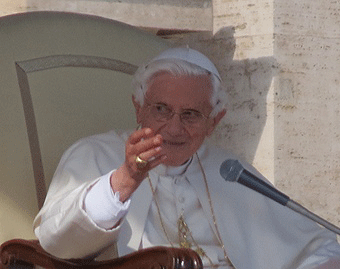 Although he no longer attends the Castel Gandolfo meeting, Benedict does say Mass at the Vatican for his schuelerkreis following their encounter. “As he did last year, Benedict will say the concluding Mass of the schuelerkreis,” Father Horn said. The topic of the meeting varies each year; last year was the question of God amid secularism, and the year before, ecumenism was the subject. The Ratzinger schuelerkreis is formed of about 50 people who studied for their doctorates under Ratzinger, but usually between 25 and 30 are able to make it to any given year’s meeting. The circle has enlarged in recent years, establishing a “youth branch” composed of academics who had not studied with Ratzinger but who are studying and developing upon his theological work.